AMTECH unlined Diaphragm (also called membrane) valve is recommended for application solvents,chemicals, corrosive fluids etc. 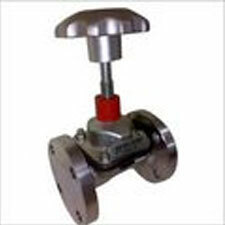 This valves provide tight shut off , primarily designed for on-off services. The Body material is CI,CS,SS 304,SS 316,SS304L ,SS316L and valves are unlined are manufacture by us.The sizes of Valves are 1/2" to 10". ENDCONNECTION FLANGEDASA 125# , 150#, Table- D, Table- E ,PN 6, PN 10,PN 16, PN 40,DIN 2533 , JIS ETC.